As promised, here is the final result... almost the first time i am seeing it for myself as well. Because as soon as it was done, i looked in the mirror, smiled, knew it was perfect and then wrapped it in plastic. So now i am seeing the final piece as well, haha. Though it is this weird angle so i cant really see the whole thing myself, but i can see it in the mirror anyway :) It is perfect according to me, the size, the shape and where it is. I also love the colours, they were a sort of last minute choice which i made on Sunday/Monday. 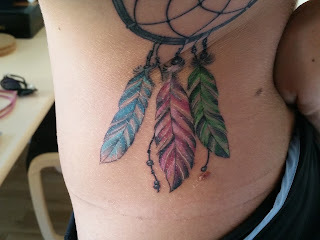 But i like it with colours... its my first tattoo with colour and it looks awesome!! How long did it take to make the tattoo? It took about 90+ minutes under the needle, and 30-45minutes to draw the actual tattoo. But i was there from 2.30pm until roughly 6.30pm. Am i going to do another tattoo? Never say never. 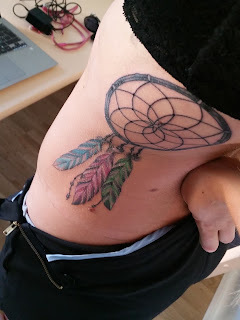 I said i wasnt going to do another tattoo after both my first and second one... but i love tattoos and think they are so beautiful so i might do another one sometime. But for me before i have done any of my tattoos i have had the idea in my head for a minimum of a year... and i know some people say you should wait 5 years and see, but i just dont have that type of patience and i think one year of waiting is good enough for me. I dont like living with regrets, so if i ever do regret them (which i hope i dont) well then its my own regrets. The reason most people worry is that the person might have regrets, but its not their problems.. its the person who got the tattoo who has the problem then. There are chances that i might get another tattoo, but each of my tattoos have a depp meaning behind them which is one of the reasons i love them so much. ^^I havent come that far yet, but maybe... hahah no. I like that my tattoos have deep meanings behind them and have alot of thought behind them. Does your boyfriend have any tattoos and what does he think about your tattoos? No he doesnt, but he would like one... but doesnt know what or where. 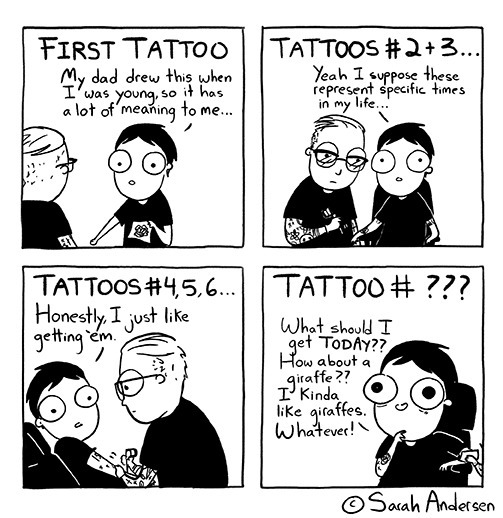 Which basically means you want a tattoo just to have a tattoo, which i guess is fine. But i think its those types of tattoos that lead to regret. Also he is very scared of needles so i kind of doubt he will do a tattoo, but once again, never say never. Maybe he will. He doesnt mind tattoos or that i have tattoos, i have been quite open about the fact that i wouldnt have cared if he didnt like them. Even if that sounds tough or mean, but i am at the stage in my life and from everything i have been through, i just dont care what opinion people have about me or my body. I have hated myself, tried to model myself into societies standard of beauty, i've cared way too much what people have thought about my body, whether guys will care that i strength train and have muscles and really amn't that feminine or girly of me. Ive spent far too many hours and moments worried about those things, and now i just dont care... I cant please everyone and the important thing for me is to be happy and healthy, that i love myself and my body. 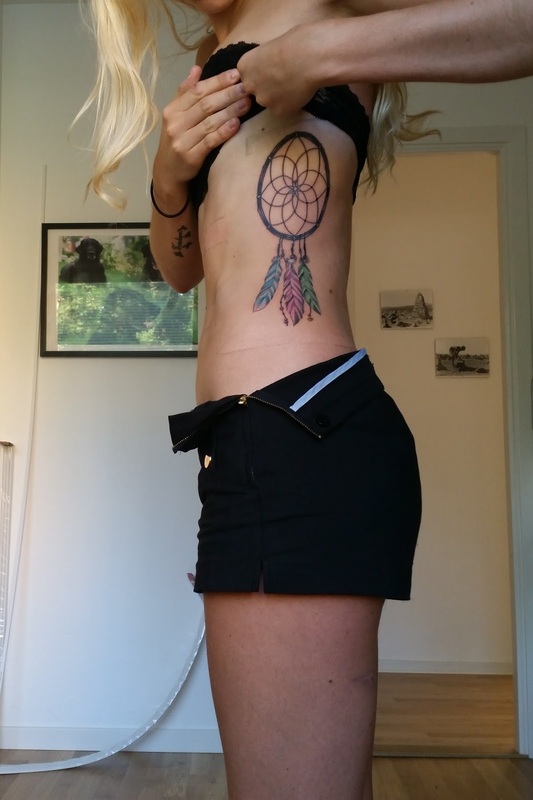 And i love tattoos, and i love the 3 tattoos i have on my body and that is important to me. 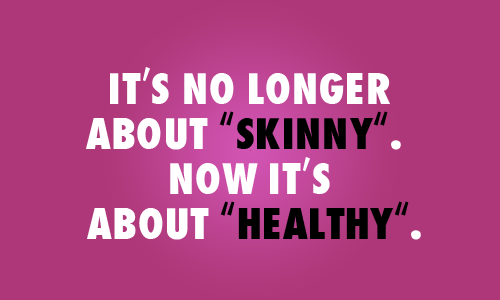 So if someone else doesnt like those, well its not my problem and shouldnt be their problem eiher because its my body. Random non-tattoo related comment (your tattoo looks amazing by the way ♡) but how do you get such a flat tummy? Is it from your core strengthening exercises? Your answer for the last question is so true, i would like to be able to think that way, but i am not in the right place yet. The tattoo looks amazing! I love the color of the feathers, and I LOVE dreamcatchers myself!